Experience the magic of Glengarriff Lodge and get away from it all! 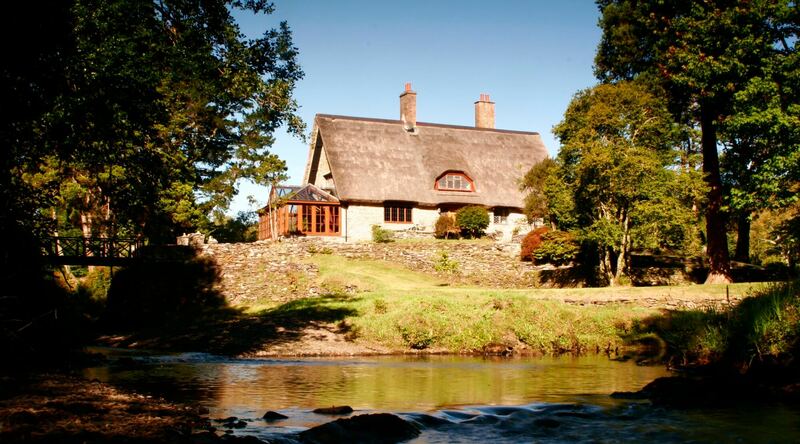 Glengarriff Lodge is a luxury self-catering villa nestled in the ancient oak woodlands of Glengarriff, West Cork. The estate of fifty acres is the location of a former hunting lodge of the Earls of Bantry and The Lodge, which is built on a private island in the Glengarriff River, offers a rare opportunity to enjoy an absolutely pristine setting in complete privacy and comfort. We offer exclusive self catering accommodation in The Lodge and an enchanting setting for boutique weddings on the estate. Enjoy our self catering accommodation and live in style while relaxing in nature! The Lodge is the ideal place to get away from it all and escape! Located on a magical fifty acre woodland estate, the lodge is situated on a secluded, leafy island on the Glengarriff River. Our self catering accommodation can host up to 8 adults in style. Enjoy the serenity of your own private island on the beautiful Glengarriff River and explore the surrounding Nature Reserve. Glengarriff Lodge Estate is a dream wedding location for the couple seeking a venue both classic and unique. Glengarriff Lodge is the ideal alternative wedding venue. With stunning gardens and a private 50 acre estate, it’s a fairytale location for any couple searching for an exceptional setting for their wedding. We are an approved venue for civil marriages and are now taking reservations for weddings of up to 180 guests.